Having a dog is awesome! A canine companion can bring a whole bunch fun and love into your life. Studies continue to show how dogs positively impact our health, both physically and mentally. If you have one or are thinking of getting one, it’s important to be aware of what it takes to be a responsible dog owner. You will be the one who oversees the well-being of your dog for many years. It is a long-term commitment that starts the day you make your dog a part of your family. #1 – Feed your dog a healthy diet. Good nutrition is vital to a dog’s health, just as it is for us humans. Cheap kibble is loaded with fillers and by-products. You don’t want to feed yourself and your family cheap, unhealthy fast food for every meal, so you shouldn’t for your dog either. Get a high-rated dog food that fits in your budget. You can check dog food ratings on Dog Food Advisor. Also, take a look at How to Choose the Right Food for Your Dog to get helpful information for your selection process. If you choose to have your dog on a raw food diet, make sure it contains all the vitamins and nutrients necessary for good health. #2 – Keep your dog clean and groomed. How often you give your dog a bath can vary depending on your dog’s breed and hair length. Short hair dogs (like whippets) can go for months without needing a bath. Well, that is, unless they are naughty and roll in something smelly. Long hair dogs need frequent baths, brushing, and cuts to keep their coat clean and free of tangles and from matting. 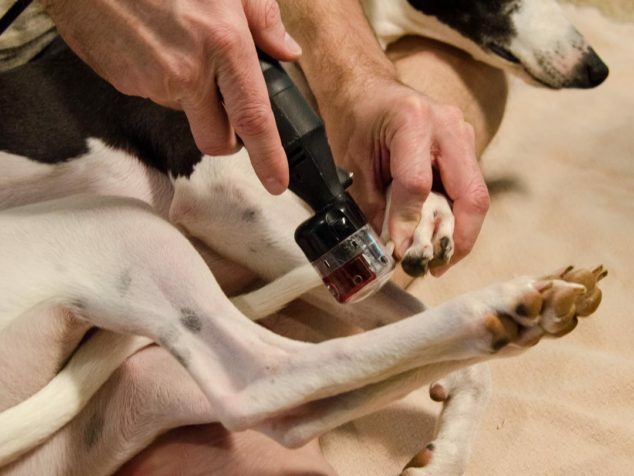 Trimming your dog’s nails is critical for their foot health and comfort. It should be done at least once a month. Take your dog to a groomer or vet to get it done if you are not comfortable doing it yourself. We use a Dremel tool instead of clippers. Keep your dog’s teeth clean. You can do this by brushing them or giving them treats that help to remove or prevent plaque buildup. Plaque leads to bad breath, tooth decay, gum disease, heart problems, and more. #3 – Have regular vet checkups and vaccinate. Take your dog to the vet at least once a year for a thorough checkup. A physical exam, blood work, and stool analysis are recommended for the vet to give a comprehensive evaluation of your dog’s overall health. Many diseases can be found and treated before they advance and become life-threatening. Vaccinations prevent serious illnesses for dogs, both for your dog and the dogs in your community. It only takes one carrier to transmit a condition such as parvo or distemper from one dog to another. Rabies prevention is important for any dog that goes outside and could have any possible encounter with wildlife. #4 – Commit to flea, tick, and heartworm prevention. Insects are not your dog’s friend. Fleas are irritating to their skin causing itching, inflammation, and infections. Ticks transmit diseases including Lyme disease, Rocky Mountain Spotted Fever, and Canine Ehrlichiosis. The AKC Canine Health Foundation has more info on Canine Tick-Borne Disease, treatment, and prevention. Mosquitos transmit heartworms. Heartworms cause lasting damage to a dog’s heart, lungs, and arteries. Discuss flea, tick, and heartworm prevention with your vet. Take the best course of action for your dog to keep those critter transmitted diseases at bay. #5 – Do not let your dog run loose. Respect your neighbors and keep them safe. This point near and dear to me. My dogs and I have been attacked 4 times while walking in our neighborhood. No matter how friendly you think your dog is, it will attack for various reasons and circumstances. This goes for dogs of all sizes and breeds. I’ve had a little 15-pound terrier run up behind me and bite my leg. I’ve had to hold back my dogs while fighting off a 90-pound bull-mix. Thank goodness a neighbor driving by stopped and helped me fight off that one. Do not cause a dangerous situation by letting your dog run loose. Always keep it on a leash or in a fenced area. #6 – Give your dog plenty of play and exercise. Both physical and mental stimulation is good for your dog. Plus it’s fun to play with your dog! You’ll both get the benefits of being active and doing something positive. Go for a walk, toss a ball, or play with a new toy. #7 – Scoop the poop. Pick up after your dog. It’s rude to leave your dog’s feces on some else’s property or in a public place. Additionally, dog poop can be full of disease-causing bacteria and parasites such as E. coli, Salmonella, worms, Parvovirus, Giardiasis, and more. The bacteria and parasites are harmful to humans, spread disease to other dogs, and can actually linger in the soil for years. If you don’t pick up after your dog, you are putting other people and other dogs at risk of getting sick. Carry dog poop bags with you when you are out with your dog. Be sure to dispose of them properly too. You can also use a pooper scooper to pick up waste in your own yard. #8 – Keep toxic items out of your dog’s reach. Dogs are notorious for finding and eating things that are harmful to them. There are lots of foods, plants, and medications that are toxic to dogs. Get yourself familiar with those toxic items and keep them out of your dog’s reach, especially if you have a counter surfer or leave your dog alone at home or unsupervised. #9 – Train your dog. Training your dog benefits all involved and around your dog. At the very least, teach your dog basic commands of sit, stay, come, and down. House training is crucial for puppies. Crate training is a good option too. #10 – Socialize your dog. It’s critically important to socialize a puppy. From 7 weeks to 4 months of age, a puppy goes through a stage that will permanently shape its personality. When a puppy isn’t socialized, it can become a fearful dog like my Milo. Exposing a puppy to different situations, places, and people makes a great and positive impact on behavior. Adult dogs need to be socialized too. If you adopt an adult dog, introduce it carefully and slowly to a variety of people, places, and situations. Make it a positive experience with plenty of treats and rewards. 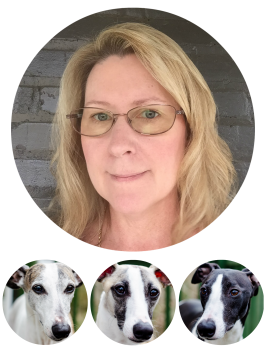 Get help from a trainer or canine behaviorist if needed. 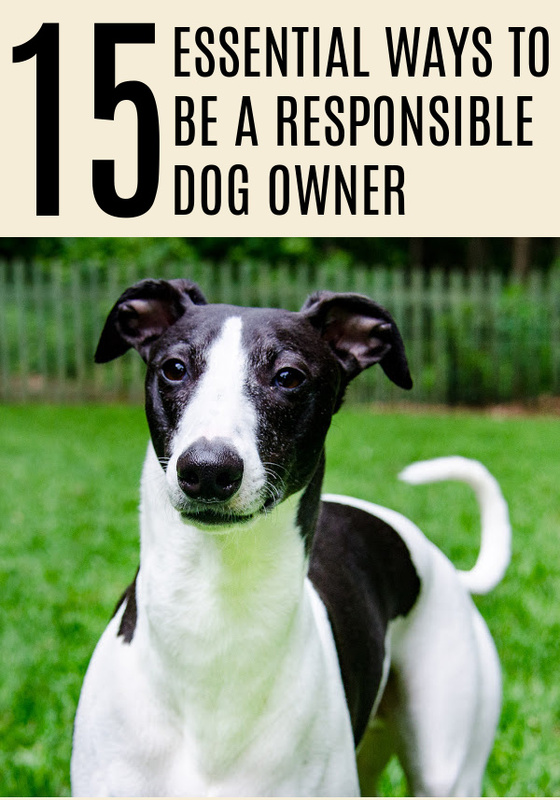 #11 – ID your dog with a tag or microchip. Make sure your dog can be identified if it runs off or gets lost. Things happen such as someone leaving the front door open or your dog gets startled and flees in fright. A tag should have your name, address, and phone number on it. A microchip is a great option if your dog does not wear a collar. #12 – Travel safe with your dog. Accidents happen. Keep your dog safe while traveling in the car. Use a dog harness that attaches to a seat belt or put your dog in a travel crate. #13 – Neuter or spay your dog. Unless you are breeding your dog, there is no reason to take the chance of adding to the population of unwanted dogs. Dogs are ingenious and tenacious when it comes to mating. The faintest scent of a female in heat will bring male dogs running. Males will jump fences (or dig under them) to get to the female. Avoid unwanted litters completely by spaying/neutering your dog. #14 – Be prepared when your dog gets sick. It’s highly likely that at some point in time your dog will get sick. It could be anything from a mild tummy ache to cancer. Take your dog to the vet at the first sign of anything concerning. 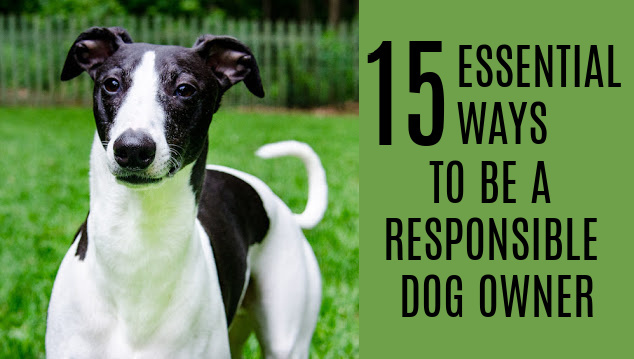 Be ready to give your dog the proper treatment. Also be ready for the additional expenses of vet bills and medications. Treatments can cost anywhere from below a hundred to thousands of dollars. This I know because of when I had 3 dogs with serious illnesses (heart disease, auto-immune disease, and cancer). We spent over $10k in one year for all the vet bills, tests, medications, and blood transfusions. 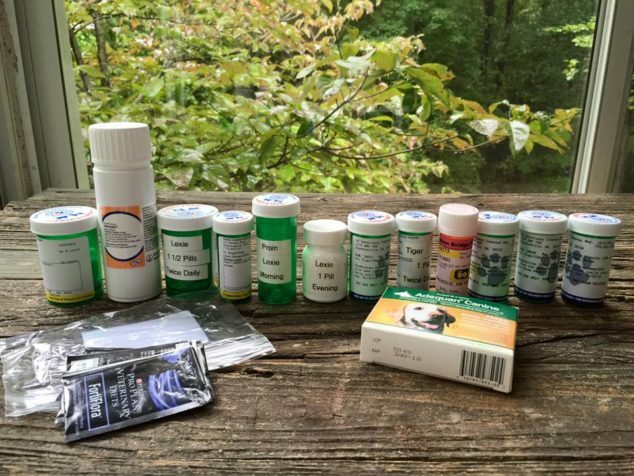 Medications for 3 dogs with serious illnesses. #15 – Show your pride! Showing off your dog is totally a part of being a responsible pet owner. I know you love to show off and talk about your dog with your friends and family. Take the next step and get your dog featured right here on Spoiled Hounds! Yes, a whole article just for your dog. How great! It’s SO easy to do and only takes a few minutes. Fill out the interview form. That’s it! One easy-peasy step to sharing the love of your dog with the world.